The 11- and 12-year-olds of the Seneca War Eagles baseball team are getting a once-in-a-lifetime opportunity to learn and play with the past at the famous town of Cooperstown, N.Y., where the Cooperstown Dream Park and the National Baseball Hall of Fame are located. However, they can’t get there on their own. The 12U Seneca War Eagles team is holding a 5K fundraiser to help it get to Cooperstown next spring. The 5K will be held on Saturday, Oct. 1 at Dingletown Sports Complex in Shamong. “The 5k can include anyone, from a serious runner to someone who just wants to come out and hang out … and donate money,” coaches Matt Davis and Mike Orth said. 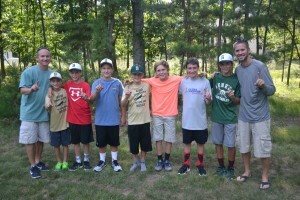 The team is made up of 12 boys, many of whom have been together on a team since they were 7 and 8, with coaches Davis, Orth and Rob Kopcho at their side. Throughout the year, they work hard to prepare for their fall and spring season. The team is all about family, it is even one of their mottos, working hard to build a strong team bond, along with learning baseball and life skills. Davis said it is not all about winning; it is about teaching the boys the right way to play, how to take a win or loss and improve a little each year. The boys have many reasons to love their team, from overnight trips to hanging out in the dugouts, but every player felt getting to know each other better is one of their favorite parts. “We’re a family,” Brayden Davis said. Though the team has had its ups and downs, it has won its share of banners over the years. Two years ago, the boys walked away with two championships, and this year won the Kingsway Knights Spring Classic Tournament. The players said they all dog piled in celebration of their win and then went to Wawa afterward. All of their hard work has culminated in the trip to Cooperstown, where 104 teams from all over the country play each year at Cooperstown Dream Park. The teams are assigned a week, and invited to stay and play against other teams. While it is there, the team will have the opportunity to check out the National Baseball Hall of Fame, wear vintage inspired uniforms and trade pins each team makes individually. “(I’m looking forward) to bonding more with everyone,” Kevin Park said. “(I’m looking forward) to watching the other teams and learning from them,” Owen Eberman said. “I hope that people come to realize what we have accomplished over the past two years. These boys are not only teammates, but they are a family. They work hard and always support one another. Cooperstown will be a wonderful experience for them to experience together,” Lisa Kopcho said. The idea of having a 5K for a fundraiser came about to help reduce the cost for families, as the tournament is very expensive. The 5k is $30 for either the run or walk, and 100 percent of the proceeds will to go to the team for Cooperstown. Registration for the 5K is available online through www.active.com by searching “12U Race to Cooperstown.” To guarantee a race day shirt, register online. Sign ups on race day are available, but there will be limited sizes and availability for shirts. Check-in is at 7:30 a.m. on Oct. 1, though same-day registrations are accepted until 8 a.m., and race time is 8:30 a.m. The Dingletown Sports Complex is located at 325 Forked Neck Road in Shamong. The team is planning future fundraisers, such as a beef and beer, but those details are to be determined. For questions and more information, contact the Seneca War Eagles team at u10swe@gmail.com.